OM Hour Meditation Service from 7pm to 8pm on Wednesdays. A contemplative service with sacred chanting, inspirational message, meditation and silence. Unity After Hours begins at 5:15PM, under the tent, with a drumming circle led by Carlos Planas. BYOD - bring your own drums and other musical instruments. At 6:00pm continue your experience in the Sanctuary with live music by Thom Sessa and guest singers, a meditation, and a talk that will surely inspire you. Exploring the components of the physical and mental human voice, our "body instrument". This process will allow the discovery of those "vocal instrument parts" and how to "place" them for the free release of "sound energies". The discovery of how speech patterns are created through our emotion and feelings. Finding how we respond or react to external stimulus and sound. Learning how to connect the speaking voice to the singing voice, as they are the same instrument. An exploration of the history and origins of the American music form known as "Gospel". Exploring the ancient west African chant that have transposed into traditional styles of worship and work song. Call and response exercises will be practiced. 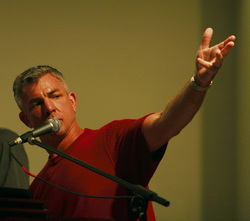 South Florida native, Thom Sessa has been creating, performing and teaching many studies of music and voice since 1974. Having been exposed in childhood to many styles of music, including a constant influence of Gospel culture in his church upbringing, it is no wonder that this form of music and expression has become his signature style and format. Aside from Thom's evolvement in the Gospel world, he has performed in club and corporate venues since 1979. Along with his various instrumental groups and vocalists, he deftly could play and sing diverse stylings ranging from standards, jazz, folk and acoustic then as well into rock, blues, sometimes a complete evening of original songs, and of course Gospel. Currently, Thom is teaching voice, keyboard and composition and serves as faculty and Co-director at Lampkin's Creative Arts 4 All in Hallandale Beach. When not teaching, Thom can be heard at various Unity and other non-denominational churches. As Thom puts it, "There's a feeling one gets in Gospel that just can't be found anywhere else".